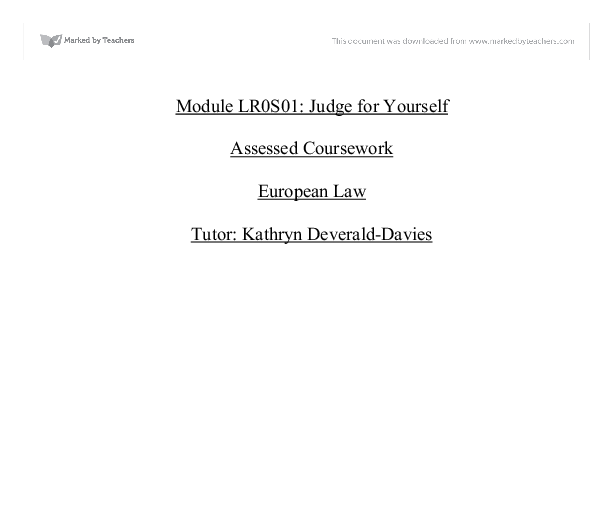 Module LR0S01: Judge for Yourself Assessed Coursework European Law Tutor: Kathryn Deverald-Davies Sian Clarke Student No: 03101754 Explain the process by which EU law is made and the process by which it is implemented and enforced in Britain In 1957 the European Economic Community (EEC) was created by the Treaty of Rome. Treaties are international agreements and the original member states were France, Italy, Belgium, The Netherlands and Luxembourg. Since then, nine other member states have joined the EU; the UK, Eire, Denmark, Spain, Portugal, Greece, Sweden, Finland and Austria and more recently as of 1st May 2004; Cyprus, the Czech Republic, Estonia, Hungary, Latvia, Lithuania, Malta, Poland, the Slovak Republic and Slovenia. The original aim was to establish a common market with no trade barriers between the countries. The aim was taken further by the Treaty of European Union in 1993 and the EEC was renamed the European Union (EU). The name change occurred mainly to reflect the aims of the Union, which are set out in Article 2 of the Treaty of Rome. These are: * The establishing of a common market * Economic and monetary union * To promote harmonious and balanced development of economic activities * To promote a high level of employment and of social protection and the raising of the standard of living within the member states. ...read more. member states or set a limit on the amount of goods imported or take any other measures which will limit the importation unless it is necessary to: * Protect public health * Protect consumers * Protect the environment * Protect public minority (per R v Henn and Darby (1979)) * Protect public security A case example illustrating this Articles' implementation would be the case of the European Commission v Germany (German beer purity case) (1984). EU law affects all states and as outlined, the main source of EU law is the Treaty of Rome, which is directly effective in all member states. The UK became a member of the EU as a result of signing the original three treaties but also because of the nature of the UK constitution. Britain has enforced the idea of direct effect through the European Communities Act 1972 which incorporates the Treaties into British law. 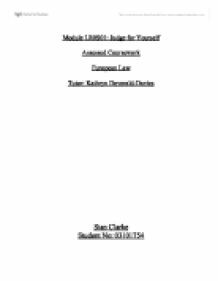 Section 2(1) of the Act is most significant, stating: * All EU law made before the UK joined was automatically incorporated into English law, at the expense of any inconsistent national law * All EU law made after the UK joined would also become part of the law. ...read more. The ECJ has taken another strategy under which it may be possible to take an action to claim damages against the Member State which has failed to implement the EU directive. This is known as the 'Francovitch principle', called so as it was decided by the case of Francovitch v Italian Republic (1991) However, a claim may only be made if: * The purpose of the directive was to grant rights to individuals; and * The directive is sufficiently clear that those rights can be identified; and * The failure to implement has led directly to the loss In the Francovitch case, the Italian Government failed to implement a directive aimed at protecting wages of employees whose employer became bankrupt. When the firm that Francovitch worked for went into liquidation, owing him wages, he could not use the directive as it had not been implemented. So, he sued subsequently sued the Government for his loss. The ECJ held that he was entitled to compensation. The principle of Member States being liable to pay compensation has been extended to other breaches by Member Sates of Community law. This was seen in the joined cases of Brasserie du Pecheur SA v Federation of Republic of Germany and R v Secretary of State for Transport, ex parte Factortame Ltd (No 4)(1996). ...read more. argue that the Council of Ministers is the more powerful EU institution. This is fundamentally on account of the fact that the Council makes the final decisions. Indeed, the Council can be considered more like the legislature of the EU rather than the European Parliament as the power to make EU laws and policies remains with the Council. of the union; * To strengthen security and remove any remaining obstacles to freedom of movement; * To give Europe a stronger voice in world matters; * To make the Unions institutions more efficient with a view to enlargement. However this policy does not only have economic implications. It is visible that the proportion of German visitors to the park has been continuously decreasing - in 2006, Germany only made up 4% of the Resort's visitors (see appendix 1). Reasons to explain this modest figure could be: * Germans don not perceive Disneyland Paris to be the "original thing." the vanguard of the movement to achieve European unity" (Newman, 1997: 6). This was the nature of British policy during this immediate post war period. Having thus far taken charge it was generally assumed that the United Kingdom would grasp the opportunity to play a continued domineering roll in an increasingly unified Europe. The most attention-getting aspect of French counterterrorism is GIGN, the Group d'Intervention de la Gendarmerie Nationale, but this small, elite counter-terrorism action team is only a small component of counterterrorism activities and policy in France.